A trace is 'a sign that remains to show the former presence of a person or thing no longer there.' (Bloomsbury Dictionary 2005: 1,528). Notions of human existence were developed in the early 1900s by French forensic scientist Edmund Locard to form his thesis that every contact leaves a trace. Subsequently known as 'Rocard's Exchange Principle', this founding work informed the fundamental rule of forensic examination, that residual evidence is always, in all situations, transferred between humans and objects. This premise informs the current practice and supporting research activities. Exploring the notion of human trace, focus is narrowed towards evidence of direct physical contact with surfaces. 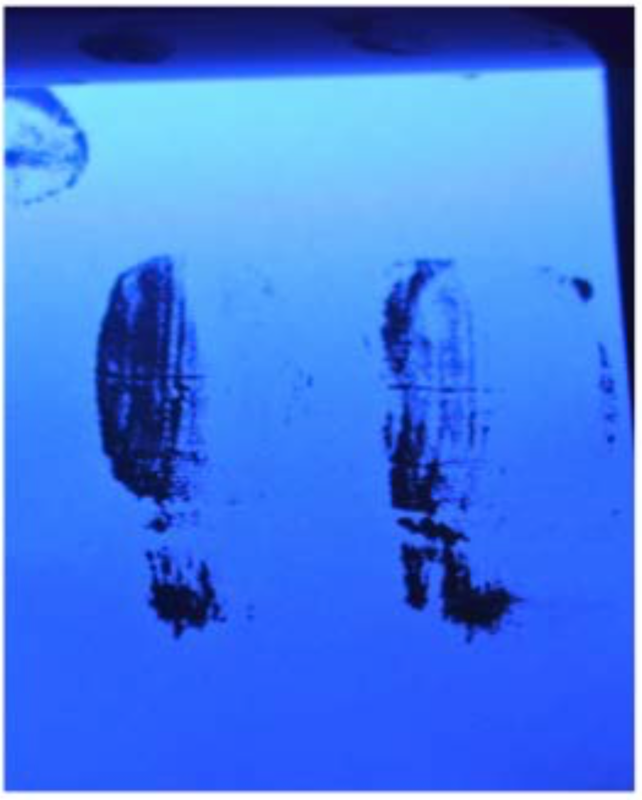 Fingerprints and foot impressions are accidental, mass produced bi-products of often fleeting daily activities. While the event may be transitory, the marks and impressions, though never indestructible, outlast and document the event and thus considerations have been given processes of preservation. Juxtaposition is central to the practice, contrasting the unintentional and intentional, synthetic and organic and the bi-product and desired outcome. Due to strong thematic equivalences to aspects of science and forensics, primary contextual research, knowledge and transferable skills were gained through first-hand contact with University Chemistry and Leicestershire Forensic Departments. Experimentation with specialised materials and processes furthered consideration of their utilisation in fine art outcomes, merging boundaries of subject specificity. 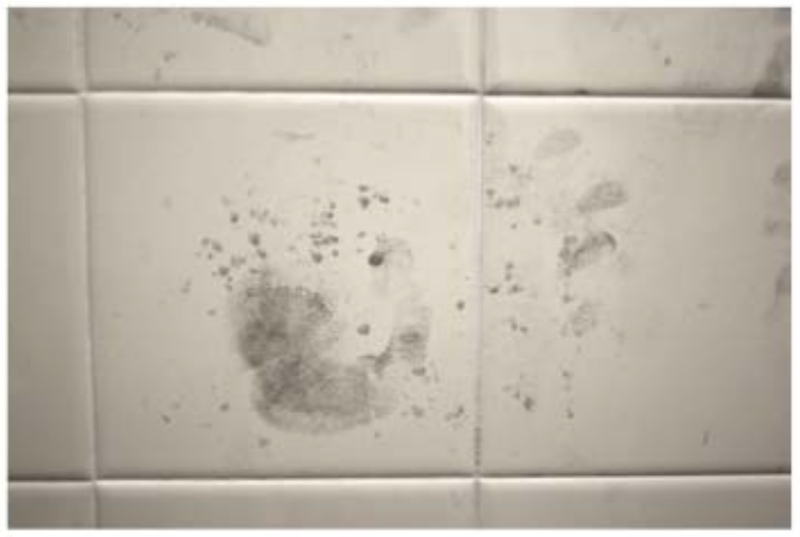 Exploration of human trace and ephemerality, encapsulating accidental and intentional marks and imprints, continue to guide and inform, in conjunction with newly acquired knowledge of forensic casting and scientific methods of exposing and documenting prints. Exploration of casting methodologies was subsequently supported by the practices of Gijs Gieskes and Christopher Locke's juxtaposing of the historic, timely and natural process of fossilisation and preservation with he employment of contemporary imagery, synthetic materials and human input. 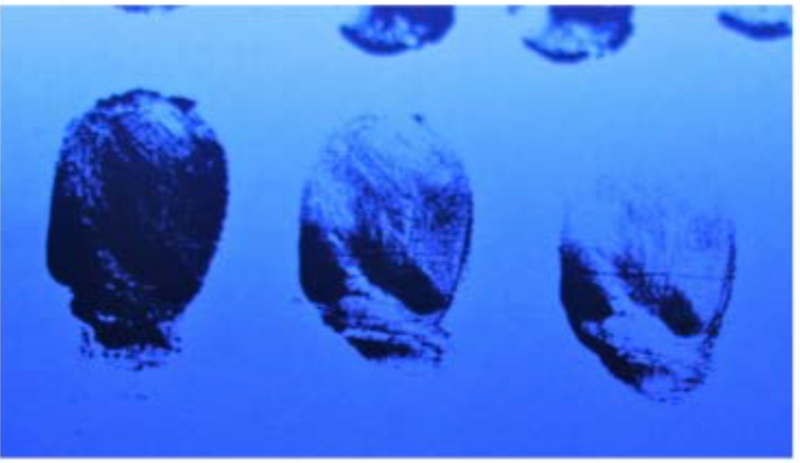 The fingerprint, as one of the purest forms of trace evidence and documentation of human activity, is presented in both synthetic and organic contrasting forms. Equally repetitious, vacuum forming provides a commercial, long-lasting method of producing a solid form while contrasting the unintentional, naturally occurring, fragile prints. Natural stone and preliminary cast work as representation of the highly gradual process of fossilisation and preservation provide both juxtaposition and similarity when set adjacent to manufactured rapidly produced plastic, preserving by nature of material. 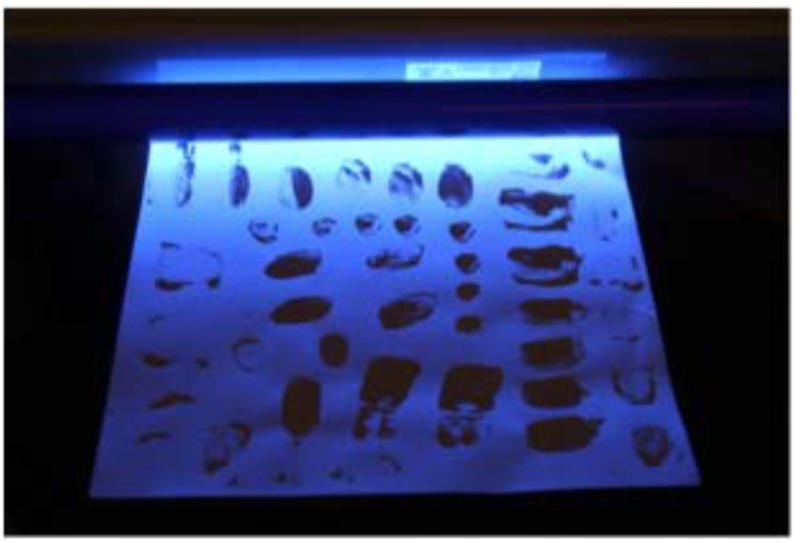 Exploration of specialised forensic substances allowed for the aesthetic merging of science and art. The conclusion of this practice incorporates both fine art and forensic science and reflects various parallels and juxtapositions. The two spaces present the visual subject of the fingerprint in oppositional processes, while the initial space allows for the contemplation of contrasting forms of preservation. The fading quality of the vacuum formed image reflects the ultimate non-permanency of the trace itself. The work does not aim to suggest the permanent encapsulation of human traces, but merely reflects the fragility of everyday events and use of trace to document and preserve the ephemeral gestures. In response to my work during SAC116 I began to explore shape and temporary form using soft materials. This previous practice had led to pictorial outcomes, using analogue methods of manipulation and shape generation. Semester two led to a change in medium as I began to use sculpture as an output within my work. The practice seeks to establish unpredictable tensions between shape and materiality, continuity and change. A combination of digital and physical processes applied to three-dimensional forms followed. However, using regular shapes including quadrilaterals and triangles together with latex proved to be limiting. Being introduced to Evoshape facilitated a broader scope for the use of shape and form within my practice, giving me access to an abundance of irregular shapes. It has enabled the continued use of random shape generation and resulted in a range of distinctive outcomes. This digital method is an advancement of that used in previously, assisting a progression from last semesters work. Characteristics such as curves and pointed protrusions combined with straightedges permit more varied outcomes. The work has the potential to rest balanced in a range of configurations, resulting in unstable and changeable sculptures. Such features also enable added points of interaction between the two chosen materials, the concrete shape and soft latex element. Evoshape is a highly efficient method of shape generation, which permits large numbers of shapes to be rapidly generated, considered and utilised. By producing a large number of related shapes I was able to be selective regarding the shapes I developed. Although randomly generated, by selecting and grading the shapes I wished to ‘breed’ this enabled artist input and a certain level of control. Characteristics I favoured within a shape could be emphasised and bred into yet another generation. Rather than working on shapes as three-dimensional forms, as presented within the Evoshape software, I chose to flatten them, considering each side, or orientation separately. EvoShape, taken from the same generation as the shape above. Translated via drawing into Illustrator to be used as a template by the Water Jet Cutter. I have expanded my knowledge of CAD based software such as Evoshape, and recognised the potential these hold to be used within Fine Art, as well as its original intention to aid Product Design. Evoshape has been decidedly beneficial to my practice, leading to a series of outcomes using wood, print and concrete. Both manual and machine based processes have been used in response to Evoshape. Difficulties faced in using the software have included accessibility and a lack of knowledge and experience using CAD programs. Due to the work commitments of the individuals involved and the limited distribution of the software using Evoshape on multiple occasions has proven difficult. However Ian Graham the creator of Evoshape and Abby Paterson have been very accommodating. I was able to use the software myself following a demonstration and induction, and have received direction throughout. During my first use of the software and further more recent access, I was able to generate usable shapes within short time frames. On selecting appropriate shape outcomes and entire generation these were saved and exported as jpegs, meaning I was able to continue to work on from the shapes in my studio. The Water Jet Cutter in the process of cutting a selected shape from a concrete slab, producing the shape itself and the negative components of the sculpture as a valuable byproduct. Being in correspondence with individuals working within the Design School has also influenced the methods by which the sculptures are fabricated. I have been able to access the Water Jet Cutter, producing a refined, solid outcome from robust concrete. The final outcome will be a series of four shapes, each generated by Evoshape, flattened through a hand drawn process and translated back into a digital format to generate machine fabricated sculptural components. The way in which Evoshape presents full generations of shapes permits visual association and correlation between the selections of shapes. The four shapes to be presented in my degree show will all from the same generation. Consequently these will correspond to each other, communicating the method by which the works were made. These atypical shapes seek to challenge the concretes material properties. Constructing these shapes as a border only, rather than solid concrete pieces means the resulting forms are often fragile rather than robust (McDonald, 2008/2009:20). Barely balanced, the non-fixed sculptural components show a potential for movement through visual tension. Jane Cook's practice is based upon the belief that drawing is the basis of all art and visual thinking. Her large scale drawings explore organic form within the landscape, particularly concentrating upon gross globalisation, environmental change and the development of unstable areas of land. The aim of this report is to show the positive development of Cook's practice whist utilising an external department at Loughborough University. The initial drawings Cook created concentrate on organic structure and shape within nature, this is achieved with research photos and direct observations. A detailed image, depicting organic shape, with supports still intact. After manufacture supports are cut away. In order to further her depth of understanding of organic structure and form Cook decided to expand her research from 2D source material to exploring 3D modelling programmes. The programme used for source material was MAYA. Whilst this programme allowed Cook to manipulate shapes and create detailed reference material for developing perspective within her work, she realised that the various viewpoints of geometric shapes within MAYA - whilst excellent, didn’t provide a personal intricate knowledge of the structure that she wanted to draw. This problem developed the idea that if she had the organic shape to actually draw from, her drawings would develop a deeper understanding into form and structure. The ability to observe an object by holding, feeling and carefully looking is well documented by the famous sculptor Henry Moore. Cook realised if she could combine visual elements with sensory input then she could achieve a deeper development within her practice. By developing the excellent links within the engineering department Jane Cook was able to learn about the development and research of Additive Engineering. This is a system of 3D printing that uses detailed computer aided drawings to develop a 3D shape. Upon visiting the Additive Engineering department Cook was able to observe objects that were of an organic form and shape. Research being undertaken within the engineering department. Particular attention to the supports around the printed 3D object have been observed. This proved to be a pivotal point in her practice. She was able to draw from an engineered shape that provided all the qualities she was seeking. This allowed Cook to create work with multifaceted viewpoints of finely detailed organic shapes that would otherwise be impossible to source. Whilst Jane Cook fully appreciates the development and exciting implications of Additive Engineering, access to the Engineering Department allowed deeper contextual awareness within her work. The ability to fully understand organic structure has developed her own research into an awareness of how biomimicry is being further advanced within contemporary society. For example: the development of components within the aeronautical industry (the ability to combine strength and lightness) is due to a thorough and developing understanding of organic structure. This is also further developed within the study of homeostasis, an area that is being applied to architecture, enabling sustainable environments to be created within a society that is slowly becoming aware of environmental catastrophe. The ability to understand the process of Additive Engineering from drawing through to finished object allowed Jane Cook to concentrate on the actual process of printing and the final outcome. The supports that hold the finished object were an area that she found fascinating. The uses of supports both ‘metaphorically and literally’ have enabled her drawings to develop. The actual act of drawing took a dynamic leap forward by merging new technology with traditional materials. A profound deeper understanding of the delicate balance of organic unity within landscape underpins her work. The supports of the engineered objects emphasised the root structure of plants. Roots create firm foundations, unstable expanses of land use support structures in earthquake zones or areas of flood. As a society in general external and internal supports are often overlooked. This aspect of ‘support’ created a new direction for Jane Cook's practice. The utilisation of the engineering department allowed Cook the ability to develop not only technically, but on deeper contextual basis. Creating drawings that consider a much deeper insight into organic structure, this provided the ability to create visually strong drawings, which have powerful social and environmental implications. Jane hopes in the future she can move her work a stage further by applying her own drawings into a system that would allow for a 3D structure to be created, enabling her drawings to have form, which in turn she could re-draw, creating a process of development and emphatic proof that drawing functions as the recognisable and stable aspect of a complex multipractice. Implied energy and movement were also part of the research discourse for The Gyroid Head, and specifically how 'space' could be freshly defined within the reading of sculptural form. The reading of implied movement in sculpture has been a longstanding issue for scholarly interpretaIon of sculpture, whether one is contemplaIng a Bernini, Rodin or Deacon, etc. DAVID. 1623, Bernini. THE KISS. 1904, Rodin. LAOCOON. 1996, Deacon. Early findings of this process is a sculpture, The Gyroid Head, that explores notions of geometry and movement within the context of the human head. It extends our knowledge of how Arts and Sciences can work in partnership, breaking down barriers and enabling creative synergies that exist within knowledge fields, usually the sole domain of specific Departments of LU. In addition, this process references historical examples of how artists have been fascinated by the Sciences, and how the Sciences can be reinterpreted through collaborative practices. An example being the “Intersections: Henry Moore and Stringed Surfaces, Science Museum exhibition in London, March to May 2012. During the 1930’s, Moore visited the Science Museum in London on several occasions. He was influenced by the mathematical string models, which are still on display at the Science Museum today. Surrealists, such as Man Ray were also influenced by mathematical objects, which often recalled the human figure. Importantly, they could be viewed from all sides and no two sides were alike. The concept of movement is also explored by the IDT and specifically Shaw and Price, using the MoIon Capture suite in the Design School and collaborating with athletes on carefully choreographed movements intrinsic to specific athletic field events. The discuss, shot and hammer have been analysed through MOCAP into 3D CAD software, which has produced a range of interesting ways of interpreIng movement, and particularly human explosive power. From the outset of this project, I was interested in how aspects of this project could link the historical legacy of Loughborough University Sports Sciences with London 2012. The success of this multi-discourse approach to research means that high profile sportsmen/women associated with LU can also be 'scanned' and their 'heads' presented as part of a series of tributes to LU’s association with sporting prowess, defined via the collusion of Arts & Science collaboration. Suggestions were Lord Coe, Sir Clive Woodward, Bob Wilson, Steve Backley, etc. This aim was part of the original submission; it was important to maintain a focus on this aspect of linking LU Sports Sciences to a global culture, via London 2012. Prof Dickens produced a number of sample examples relating to the Additive Manufacturing process. The geometric tessellated structures, made manifest by 3D printing, have stimulated a plalorm for creative accord between John Atkin (School of the Arts) and Dr Guy Bingham (Design School). Bingham is an expert in 3D CAD modelling utilising a variety of software systems that contrast with Atkin’s traditional approach to understanding the mass, volume and form, of the human head. Synthesising these disparate approaches to the lingua franca of explaining sculptural voids is at the heart of their research, which was explored through a variety of strategies that harnessed traditional methods of making cultures, and digital approaches to producing artworks. The aim of this aspect of the project is to amalgamate these two approaches of realising “form mass & volume”. The head profiles on the left (above) rely on tradiIonal methods of making sculptures, via life casting and mould making. Our aim was to utilise cutting-edge scanning devices to take the place of “casting & mould making”, and to use the tessellated rhythm of AM structures to describe “form mass & volume” (traditional methods of describing sculpture) without recourse to mimicking appearance. The first stage of this part of the project was to uIlise Abby Patterson’s (Research Assistant-John Atkin), hand held scanning techniques, and plotting this information into a CAD format that could be transferred into the Additive Manufacturing (AM) process in Mechanical Engineering. Paterson's method of “capturing” an image replaced traditional methodologies of modelling or taking a life cast from a sitters head, replacing it with innovative ways of scanning specific points of the human head, that could be later used in the 3D printing process. The scanning approach to rendering the human head rendered a shell of the surface of the subject, and enclosing a void, which was to be explored later by Atkin & Bingham when addressing ideas relating to form, mass and volume. A CAD drawing of the informaIon supplied via the hand held scanning technique was then translated into a 3D model by Atkin and Bingham: stripping away the surface render of the image (the appearance of the subject) in order to explore novel ways the form, mass and volume of the “head” could be explored via geometric tessellated surfaces. Dr Ian Graham’s pioneering software technology, Evoshape, has stimulated the exploraIon of elegant abstract forms by numerical input. IDT workshops by Graham and Abby Patterson (Research Assistant -John Atkin) quickly established a visually accessible lingua franca that was exploited through the existing technologies and research within LU: addressing traditional and pioneering methods of making and production. Notions of making and production have changed rapidly since the advent of new technologies and the authorship of “producIon- based” artworks has opened up debate that crosses the divide between traditional methods of making and production. The ability of EvoShape to suggest a range of shapes and then deploy simple methods of breeding families of forms has already demonstrated potenIal within the Design School environment. With the unexpected addition of a new member to our IDT team, Eccles Ng (Pioneers in Practice), the potential to extend this knowledge pool into a wider community that encompassed Landscape Architecture, has potential for future Research & Enterprise initiatives. EvoShape demands four-digit numerical input that stimulates a range of initial forms based on the sequence of numbers. The user then selects shapes and scores them on a scale of 1 to 10 in order of preference. This process then facilitates a family of forms generated form this selection procedure, which is then refined and developed using the same user-interface until a form(s) is finalised for design or other purposes. Eccles Ng utilised part of his time with PLUG-IN to develop a strategy for EvoShape that extends its use from design-based products into the Public Realm within the discourse of Landscape Architecture - his own area of expertise. Undergraduate student, Colette Griffin used EvoShape extensively in her Final Project work, and her findings will be detailed later on in this blog. This project explored the interface between art and science using the arts to help broaden public understanding of the molecular action of medicines. Berry had been undertaking her own scientific research project as a stimulating theme for new artistic installations. The aim of the project was to help communicate underlying science to a wide public audience, beyond those who might normally attend science exhibitions or art galleries to view Contemporary Art. Michael Shaw discussed his sculptural practice in relation to the benefits of drawing on expertise, equipment and materials from varying disciplines and how this can enhance the development of dynamic singular form in sculpture. He also outlined his approach to his project Dirty Digital under the auspices of Bridging the Gaps, through which he intended to explore the sculptural interface between the digital and analogue, and to ascertain the consequences of repeatedly passing geometry from one realm to the other. This naturally entailed a multi-disciplinary approach uniting areas including ceramics, fine art, animation, design and technology, manufacturing, engineering and, if viable, chemistry, material science and others. Michael Shaw talked about his sculpture practice, focusing on how he uses computer-aided design and manufacturing (CAD/CAM) to develop form and enable fabrication in the real world. The second half entailed a brief demo on CAD software including Maya and Rhino, explaining how this can be incorporated into art and design practices. This provided a useful introduction for students unfamiliar with 3D software to gain an overview of its potential to aid the production of exciting and dynamic geometry. Berry and Shaw delivered lectures on their work to an audience which included the IDT members, Undergraduate students and Post-Graduate students at the Cope Lecture theatre, May 16. The opportunity for a 20 min Q&A at the end led to individual tutorials for interested students. The primary aim of the project, PLUG-IN, was to establish an Interdisciplinary Design Team (IDT) of Arts & Science colleagues from different Departments within Loughborough University. The remit of the IDT was to investigate effective ways of breaking down subject barriers and explore the potential for effective collaborative practice. The original concept was to connect Loughborough University's world renowned expertise in Sports with London 2012. The IDT decided to explore this topic through examining ways that arts and science research might stimulate 3-dimensional forms: utilising pioneering digital technologies and traditional methods of making: relating prototype outcomes to Culture & Sport. At first, collaboration rather than specific outcomes was central to the Bridging the Gaps project. It was important to get different departments to work together and establish a sustainable dialogue that could be carried forward long after the project date had closed. This approach also promoted the concept of sharing knowledge across subject boundaries and how this knowledge could be applied to research that stimulated fresh ways of thinking. Breaking down subject barriers was addressed through formal and informal meetings from project inception. It meant looking at ways that the budget and timetable (June 29th 2012) could be synthesised in a way that stimulated multi-department activity across specific areas of research excellence. The budget to facilitate two research assistants, Matt Price, and Abby Patterson, was extended to accommodate two research collaborators, Michael Shaw and Jo Berry, both with historical links to LU and a studio practice immersed in cross-cultural, arts & science synergies. Shaw worked alongside Paul Kelly (Chemistry), Phill Dickens (Mechanical Engineering), Guy Bingham (Design School) and Matt Price, (Research Assistant - John Atkin) to look at how Sports Science-related human movement could be captured using the MoIon Capture suite in the Design School. Shaw’s research had already explored human movement via dance related activities: IDT discussion prompted the idea of interrogating via MOCAP the carefully choreographed movements of the discuss thrower, the shot putter and the hammer thrower into 3D CAD software that could stimulate a multiplicity of approaches to understanding movement & energy. Shaw also organised and led a workshop for students wishing to understand how sophisticated software systems (such as MAYA) can be used to explore cross disciplinary ideas for art, design, engineering & sciences, based on his own AHRC Research Fellowship, completed at Loughborough University 2008. Shaw's blog about his research practice and methodologies fed into the process that the IDT had already established in the early phase of the project. Berry also shared a blog which tracked the progress of her work and how it built on cross-departmental practice. Her chief goals were to explore how Chemistry, Materials Research and Printmaking could be synthesised in novel ways that addressed her own research history, as well as the objectives of the Bridging the Gaps project. Bridging the Gap was a project run by John Atkin, EvoShape founder Ian Graham, John Edwards in 2012.